For all those looking for a daily skincare product that offers 24 hour hydration and radiance. Ideal for normal-dry skin. Its luxurious and rich texture gives the skin a soft, velvety feel, with a light fragrance of tea and white flowers. Aqua (Water); Glycerin; Olus Oil (Vegetable Oil); Maris Aqua (Sea Water); Dicaprylyl Carbonate; Octyldodecyl Myristate; Prunus Armeniaca (Apricot) Kernel Oil; Butylene Glycol; Trimethylolpropane Tricaprylate/Tricaprate; Behenyl Alcohol; Lauroyl Lysine; Sodium Polyacrylate; Squalane; Yeast Extract; Hydrolyzed Viola Tricolor Extract; Hydrogenated Vegetable Oil; Phenoxyethanol; Hydrolyzed Beta-Glucan; Oleic Acid; Beheneth-25; Hydroxyethyl Acrylate/Sodium Acryloyldimethyl Taurate Copolymer; Parfum (Fragrance); Chlorphenesin; Polyacrylate-13; Polyisobutene; Candelilla Cera (Euphorbia Cerifera (Candelilla) Wax); Glyceryl Stearate; Ethylhexylglycerin; Sorbitol; Polysorbate 60; Sodium Phytate; Lecithin; Sorbitan Isostearate; Xanthan Gum; Caprylyl Glycol; Disodium EDTA; Polysorbate 20; Potassium Sorbate; Sodium Benzoate; Glyceryl Caprylate; Phenylpropanol; Alcohol; Sodium Hydroxide; Citric Acid; CI 77491 (Iron Oxides); Limonene; Linalool; Hexyl Cinnamal; Citronellol; Geraniol; Citral. 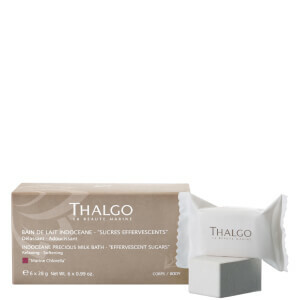 Save 15% off Thalgo and receive a FREE Thalgo Precious Milk Bath with every purchase from the brand. Gift added automatically at checkout. While stocks last. I’ve been using this product for a while now and it’s light and nourishing, it smells delicious and leaves my skin feeling smooth! As most of us have, we've tried everything under the sun. And I'm no different, but when I went to my local skin clinic I was given a samples of "thalgo" products.. OMG, with in a week I had notice such a change, my skin looked and felt 100X better than ever. I have now brought a number of products and am loving how smooth and moisturised my skin is feeling. BEST STUFF EVER! !